How to Save Your Dog's Life . "I climbed over the fence and Click and Tom went through it. About 15 yards across the fence I saw blood on Tom's front legs. I went to him and saw that there was blood everywhere." Clay Thompson from SportDog had been hunting with me this week but he was feeling a little under the weather and stayed back at the hotel. Around 7:45 I turned out Em, Tom and Click. Em found a covey of blue quail about 15 minutes out. The birds acted like they had never seen a dog or a hunter. I doubt the area I was hunting gets much pressure since it is not buggy friendly. The Covey flushed a little out of range. I watched them down and we followed after them. All three dogs started getting birdy. Click pointed the covey and I killed one on the rise. Rare to get that close to a covey rise on blues. We went after the singles. Em had a nice point, but I was too far out to shoot. Saw a few others but no luck. We made a big loop and turned back in the direction of my truck when Em crossed a fence and went on point about 600 yards out. I climbed over the fence and Click and Tom went through it. About 15 yards across the fence I saw blood on Tom's front legs. I went to him and saw that there was blood everywhere. My first thought was that he must have killed something and it was animal blood since there was so much. I have had this happen before but you normally hear the ruckus when they start to fight. I had to use my water bottles to wash all the blood off to find the cut. He had sliced open the vein on the front of his left front leg on the barbed wire fence. Blood was coming out at a pretty quick pace. I got really lucky that he was close to me when he cut his leg. Had he done it at any distance away from me, I expect he would have bled to death before I realized what was going on. I took out my handkerchief and made a tourniquet. I took off his Garmin Astro and Ecollar, my vest, and I dropped my gun next to the fence. I lifted Tom over the fence and grabbed my Astro receiver. I could not carry him and my gear so I left the gear. I could pick it up later since the Astro was there. I held my hand over the wound to stop the bleeding and started running toward my truck. It was about 1/2 mile away. I checked my Astro to make sure I was going the right way and I called Click to come with me. At this point I was covered in blood. I moved as quick as I could to the truck where my first aid gear was. I really need to start working out more. 40 pounds of dog is a lot to haul. At the truck I opened my first aid box and found my forceps. I pinched off the vein to stop the bleeding. I then wrapped the forceps and his leg in vet wrap. I threw Tom in his dog box and put Click in his. I jumped in my truck and headed toward the main road. I turned on my Garmin Nuvi GPS and typed animal in the search box. The closest vet was 16 miles out. The gps gave me the phone number so I called to make sure the doctor was there and I headed out. Em was still out running but I didn't think Tom would make it long enough to find her. Since she had her Astro on I knew I could find her later. I broke a few laws getting to the vet. I really expected Tom to be dead before I got there but when I opened his dog box he was sitting up looking at me like nothing was wrong. We ran into the vet's office and the doctor was waiting on us. After getting him settled in I washed as much blood off of me as I could and headed back for Em. It had been about an hour since I last saw her. When I got close to the lease I hooked up my Garmin Astro Cartop antenna and it picked her up about 3 miles out. She was on point. I could tell from the map that she was close to the road and my first thought was that she had gotten out in the road and been hit by a truck. The Astro can only tell if she is not moving. I drove down the road until I passed her. She was about 500 yards off the road still on point. I had to back track to get close enough to her. I drove within 200 yards of her and got out of the truck. I walked straight to her. She was locked up on point. I walked up and flushed a single blue quail. We headed back to the truck and I drove down the road to find my vest and gun and the rest of my gear. Tom's Astro collar took me right to my gear and I picked it all up and headed back to town. Pretty neat. This was the first time in 25 years of running dogs that I had a dog come this close to dying in the field. I got really lucky. If I had not been close to him when this all happened, I would not have been able to save him. 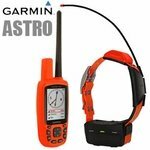 Had he died in the field, I would have at least been able to find his body with my Garmin Astro. If he had died without any kind of tracking collar, I might not have ever known what happened. 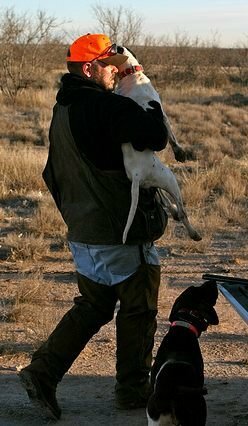 Texas is a big place to lose a dog and finding him without some kind of tracking device would not have been easy. The Garmin Astro also made it possible to leave all my gear behind (with my gun, vest and ecollar, it was about $2000 worth of stuff) and pick it up later. It also made leaving Em behind an option. I knew I could find her after I got Tom some medical help. It's also important to note that having the right first aid kit saved his life. 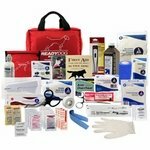 I was using the Ready Dog kit. Just got off the phone with the Vet. Tom is doing fine.